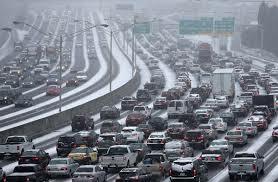 Winter storms are rare here in the Metro Atlanta area, but when they do hit, how do we deal with them? Yesterday the snow started around 10:30 in areas across Atlanta. The weather was in the 60’s just a few days before. Monday night I received an alert from the national weather indicating a major winter storm watch for our area, beginning Wednesday morning, after tracking the radar most of the night, you could see the storm was coming in early and going to hit hard. 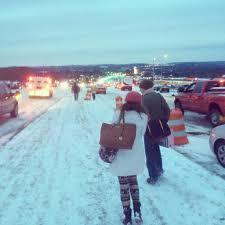 Thankfully, most of Fayette County took heed and closed businesses and schools, unlike other areas, such as Atlanta. Now the mayor of Atlanta is saying the best hope we can get is warm weather, but today will not get much about freezing. The strong winter storm is a rarity for one of U.S.’s most congested cities. How do we better prepare ourselves and family for these kind of events. What we need to remember is a storm or disaster or even an accident can happen anytime, anywhere. One basic essential should always be an emergency supply kit for the home and car. And, if you can a one day bug out bag. Something, I made for all of my children. What goes in an emergency supply kit? I will start with what you should keep in your vehicle. This is so critical. I can’t stress enough how these two simple kits can save your life. You may say, we don’t have storms that often. Ask yourself is $50-$100 in a kit that stays in my car and last season after season, worth it? Remember these kits are also for any emergency, like disasters, storms, accidents, etc. Don’t be a victim. Be prepared. Now for your First Aid Kit (First Aid Kits such as this can easily be may for under $20. Most of these things you will already have. These are simple life saving kits. Another thing everyone should make is an emergency plan, that includes numbers of loved ones, in state and out of state. Locations to meet in case of disaster, such as a local place to meet close to your house, one in the county and one that is about 3-6 hours away. Remember, in some disasters, the local phone system may not be operational. So having a contact out of state, that all the family knows is a good idea. I hope this event will open everyones eyes. We were in route from Gadsden AL to Western NC yesterday morning. Just past the GA line the weather took a turn for the worse. We made a “survival” decision and turned around and headed home. With in a few miles of our house we started seeing accidents and abandoned cars. Fortunately we made it home. We couldn’t make it up our 1/2 mile drive, but we were home. We turned on the news as soon as we walked in and saw the havoc already caused by the storm. My husband nor I EVER leave home without our bag that contains at least three days worth of water, food, warmth, and shelter. I felt really bad for those folks stranded out there with nothing. Hopefully that never happens to them again! Wendy, amazing how quickly people forget. I hope they will see how important it is. Christian, You beat me to it, excellent lists! I tried to link the Facebook app and it said the link is broken. Lol Thanks, I will check that out.